Spring is probably my favorite season. And daffodils are one of my favorite parts of that season. I haven't seen too many daffodils yet this year, but the crocuses are up, so I know the daffodils are not far behind. Every spring, I celebrate the advent of spring with one of my all-time favorite poems, "Daffodils," by Ralph Fletcher. "Daffodils" first appeared in Ralph's book, ORDINARY THINGS: POEMS FROM A WALK IN EARLY SPRING. The book is almost twenty years old, so it's definitely an oldie but a goodie. If you don't already own the book, it's still available on Amazon. I'm trying to learn to use Mr. Linky, but I'm having a few technical difficulties. For now, I guess I am just going to go old school, so leave your comments and I will round them up tomorrow. Carol, I don't see Mr. Linky yet, so I'm going to post my link here. Thank you for posting, and for the lovely daffodil photos and poem. I love daffodils, and we don't have them here, so I always enjoy people's photos when they are out! I've been enjoying following lots of PoetryFriday friends on Instagram - and seeing assorted bulb-flowers blooming. Here, we've had a flush of green, at last, after much-needed (more needed) late rain. Not quite the same - but equally joy-filling! Happy Spring, Carol! Lots of daffodils in our neck of the woods -:0) Thanks for sharing Ralph Fletcher's poem and book. I'm in with a short post & Archibald MacLeish's Ars Poetica. Your post is bursting with sunshine and Spring, thanks for all these gifts and the showy daffodil poem. Thanks too for hosting this weeks Roundup! 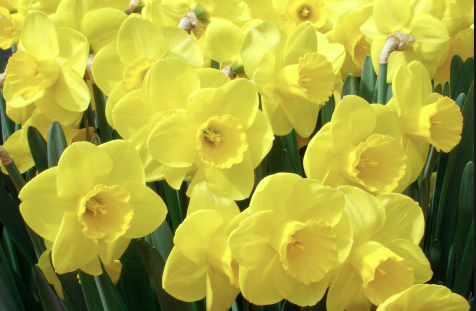 Your daffodil poem is a lovely way to welcome spring. Ralph Fletcher is one of my favorite poets. This week, I'm also welcoming spring with a little help from some bird friends. Thanks for sharing Fletcher's poem, Carol. It's new to me and so lovely. Just perfect!! This week I have a review of Pancakes to Parathas, a picture book by Alice B. McGinty, with a little breakfast buffet. I'm also collecting links from any bloggers who want to be included in my 2019 Kidlitosphere NPM Events Roundup. Thanks for hosting (my link goes live at 6 a.m. Friday morning). Thank you for hosting my Denver friend. I hope we don't get much snow tonight, only rain, please! I love Ralph Fletcher's 'yellow', think you will like my new blog header, changed a couple of weeks ago. I'm sharing about the coming April goals & some poems from Laura Shovan's birthday month celebration: https://www.teacherdance.org/2019/03/poetry-friday-tuning-up.html Happy Friday! Happy Spring to YOU, Carol. Those daffodils just make me smile. They are a sure sign of spring. This week, I'm sharing a behind the scenes look at Poetry Pandemonium that I brought to my school (with a lot of help) from my friends. Anyone tweeters that would like to follow along are welcome to follow @librarymiddle for daily progress. Hi Carol! Thank you for hosting and for sharing Daffodils :-) We call my parents' house Daffodil Hill because they have so many. With much appreciation to all the Poetry Friday poets who contributed! And asking readers for a favor. Happy Friday! Hi, Carol! Thanks so much for hosting and for introducing me to this lovely poem by Ralph Fletcher. Daffodils are an inspiration, aren't they? I'm in this week with post that's serving double duty for the SOL Challenge and PF. I'm sharing an ekphrastic poem I wrote responding to a Richard Avedon photo. Thank you for hosting today, Carol! Daffodils are a favorite of mine, too. It's been cold here in CT this month, so we're still a few weeks away from our daffodils putting "on a little show." Today I'm sharing a poem about pancakes, inspired by my prompt for Laura Shovan's February Poetry Project. Daffodils just conjure up spring, don't they? Happy Poetry, Friday, Carol. You're brave to take on Poetry Friday right in the middle of slicing madness. Thanks for hosting! I'm linking up with a "first poem" written by grandson Jack and me. I wish I could add the video of him reciting it yesterday at breakfast. Thanks for hosting this week! I am obsessed with wisteria this spring, but daffodils run a close second! My post is a simple plug for my National Poetry Month features. That's all! Thank you, Carol, for sharing this beautiful poem and for reminding me of this book. I am so grateful that spring is here! Over at The Poem Farm, I have a poem about something I keep on my desk. Thanks so much for doing the roundup this week! Lovely poem! At Wild Rose Reader, I've posted about my planned book giveaways during National Poetry Month. 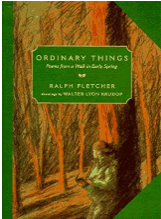 Love Ralph Fletcher and have several of his books as I used to lead a Writer's Circle for Third Graders. Joy Write is also a favorite by him that I have read and put into use! Thanks for hosting this week. Thanks for hosting and for the daffodils. Mine are up, but won't be blooming for awhile yet. Carol as the host of PF, I thank you for brining in springtime with beautiful daffodils. Today, I am offering a post, All Things Poetic as a prelude to National Poetry Month at https://beyondliteracylink.blogspot.com/2019/03/march-musings-19-all-things-poetic.html. I am kicking off NPM with a Twitter event on 4.8.19 at #WonderChat & #NYEDChat with Sylvia Vardell and Janet Wong as co-hosts. Thanks for the lovely post! I am offering a found poem today about the opening day game for the Philadelphia Phillies. Hurray, I'm celebrating spring on my blog, too! After such a long winter, I'm sharing a sunny haiku to welcome back Mr. Sun. I'm all about spring today, too, Carol, with "Spring (Again)" by Michael Ryan. Oh good heavens0--I worked hard this morning to get my psot up and then forgot to link!!! Thanks for hosting this week! And I really like the daffodil poem. I wanted to post something today, but I just don't have it in me. I'm loving being in Colorado, though--and loved this rainy/snowy afternoon. And in spite of my lack of poetry this week, I thought I'd stop by and say hi.